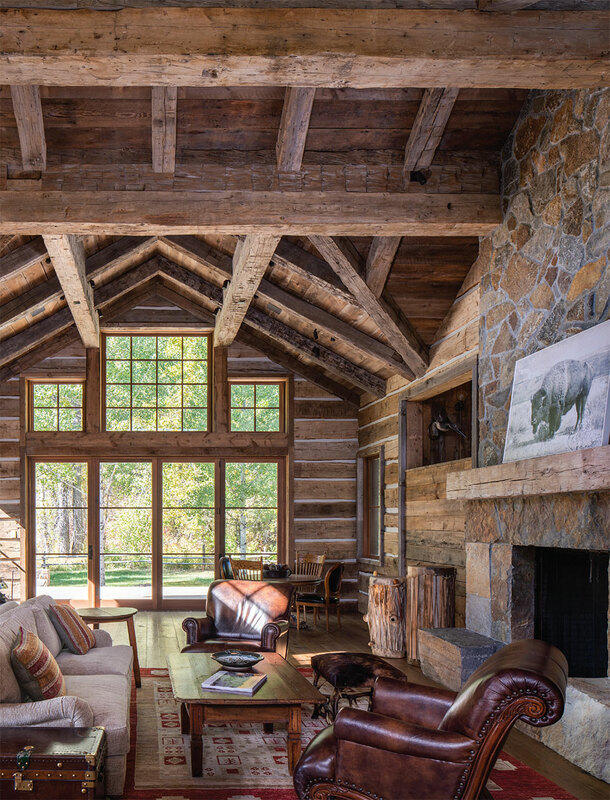 For over 20 years, Taylor Woodworks has given new life to trees through their custom cabinetry, furniture, and architectural details. It’s a profession that Scott views as equal parts optimism and sleeves-up hard work. Optimism, in the sense that he feels his craft is a conduit for timber that might otherwise be unloved; an opportunity to do right by a great piece of wood. A buzzing workshop and lumberyard in Hailey, where Scott and his team of 13 people manage every step of the process, from milling to installation, is evidence of the hard work. 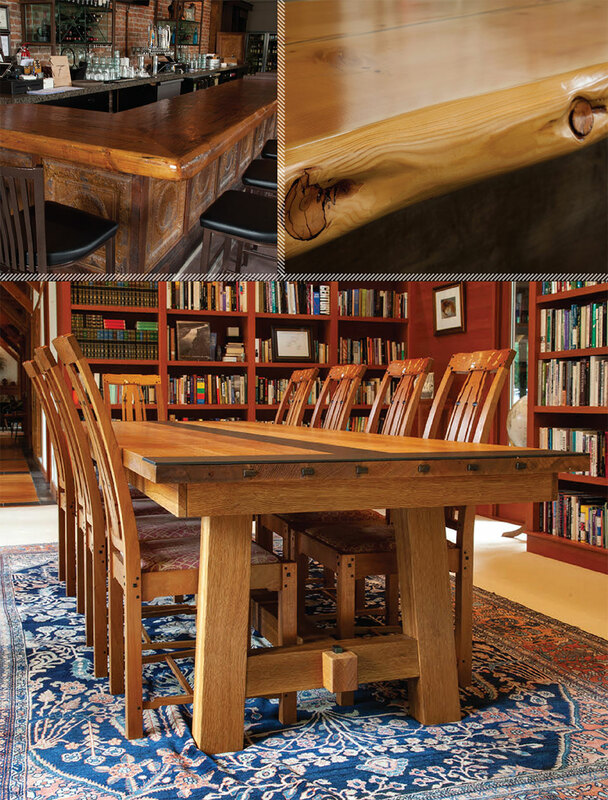 On the furniture side, the craftsmen at Taylor Woodworks express themselves through work that features both detailed joinery and open, organic forms. 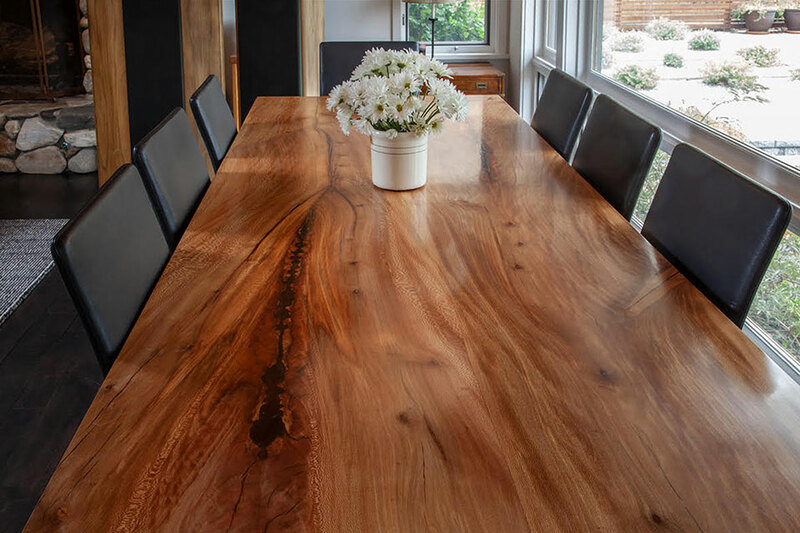 Large slabs of live edge hardwoods are central to many of their recent custom pieces. The Taylor Woodworks yard is where this work originates. A selection of milled lumber, stacked in boule form (in order of sawing), sits there to air dry for two years before being kiln-finished and brought into the supply of the craftsmen. For furniture pieces, clients have the opportunity to preview slabs and see what speaks to them personally. Scott can also act as matchmaker, marrying what he knows about wood with what he knows about the client or project. A maxim for Scott and his team is to work with the slab in its most authentic state. He explains, “I don’t see flaws in wood. I look at checking, cracking, and pith centers as expressions of the tree.” He works those expressions into the design, often featuring them with the addition of butterfly joints in contrasting materials that add integrity to the design. “We try to honor the life and the essence of the timber. It’s our goal to use it completely and in its most organic form.” The result is the transformation of a tree into beautiful custom pieces that have a soul all their own. The tradition of building is in Paul’s DNA. He pounded his first nails on the job sites of the third-generation family business in Virginia, then moved West, to California’s Humboldt County, where his appreciation for fine woodworking grew. “I worked a six-foot-tall vertical circular saw to mill fallen redwoods and built a home almost entirely out of redwood there. The melding of that experience with my family’s heritage in commercial construction is who I am today,” Paul says. This range of work is shown in the mix of Conrad Brothers’ large-scale commercial projects and many high-end residential projects throughout the Sun Valley area. The path Wes Walsworth takes to his downtown Ketchum woodworking shop, adjacent to his home, is short in physical distance but long in experience. It winds through a career in music and his years spent working at vineyards in Australia. Each of these pieces of his past seems to have informed the next, eventually leading the Sun Valley native to boomerang back to Idaho in order to refine his craft. When Wes moved back stateside in 2010, he brought the woodworking skills he gained at both Taylor Guitars and from his father, a Sun Valley custom home builder by trade, and also drew inspiration from the patina and curve of those barrels he found in Australia. From there, Wes began creating rustic modern furniture, with the natural lines of spent barrels lending grace and ergonomic contour that belie the rustic character of the material. The current trend of Walsworth Furnishings’ work moves the needle from rustic reclaimed wood to fine hardwoods, but Wes still holds a deep appreciation for the previous life that each piece of reclaimed wood brings to his shop. A stack of wine barrel pieces sits in his curing shed, and he is friendly enough with each of them to guess at the varietal they might have held in their previous life based solely upon their stain of red or the aroma they release when cut. 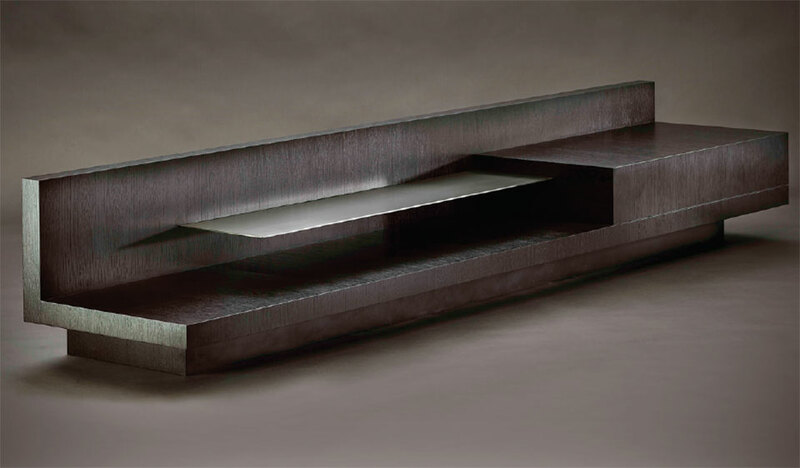 In many of Walsworth’s current pieces, the interplay between wood and steel defines his style. “I like the contrast between the two materials,” Wes says. “Putting polished steel up against rustic wood, or vice versa, really amplifies the beauty of both.” He plays with new techniques like steel and wood joinery, and creates sculptural forms like his cut steel drawer pulls that are still functional to the furniture piece. 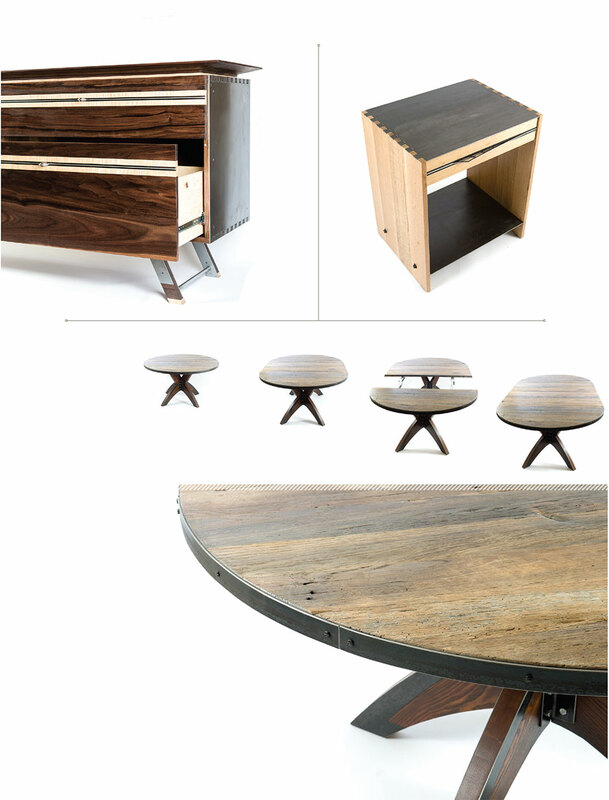 Scattered around his workshop are the components of an expandable reclaimed oak and ash dining table with lines that evoke mid-century styling while still retaining a mountain character through his choice of materials, and finishes that include steel edging and leg brackets. Wes strikes a similar balance in his design concepts, which continue to move where his artistic vision takes him, while always remaining somehow versed in a mountain aesthetic. This is perhaps because, though he sells his work nationwide online, putting Walsworth furniture in almost every state of the union, he still views the custom work he does for the Sun Valley area as central to his business. 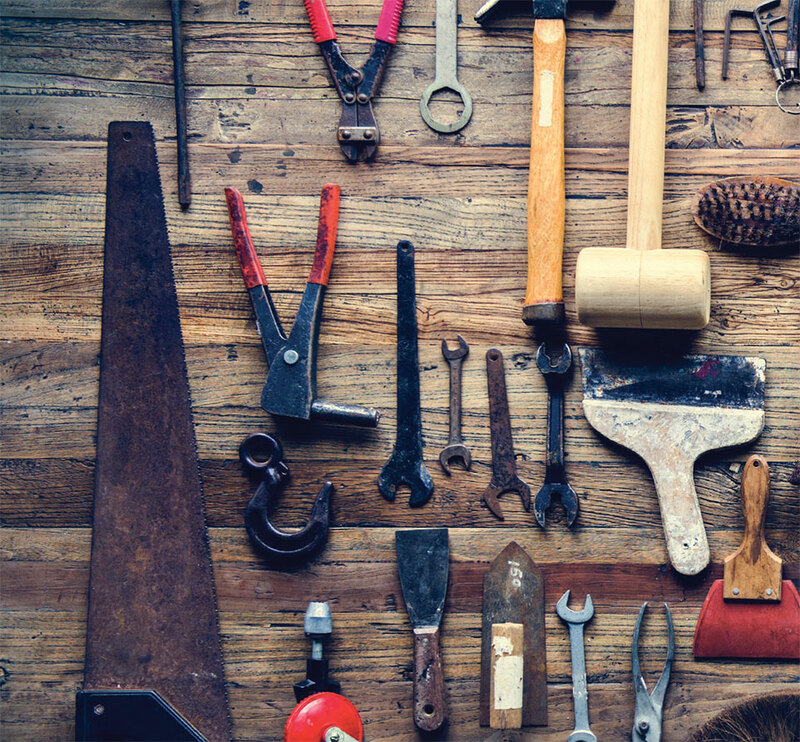 Experience in woodworking is gained board by board, year after year. 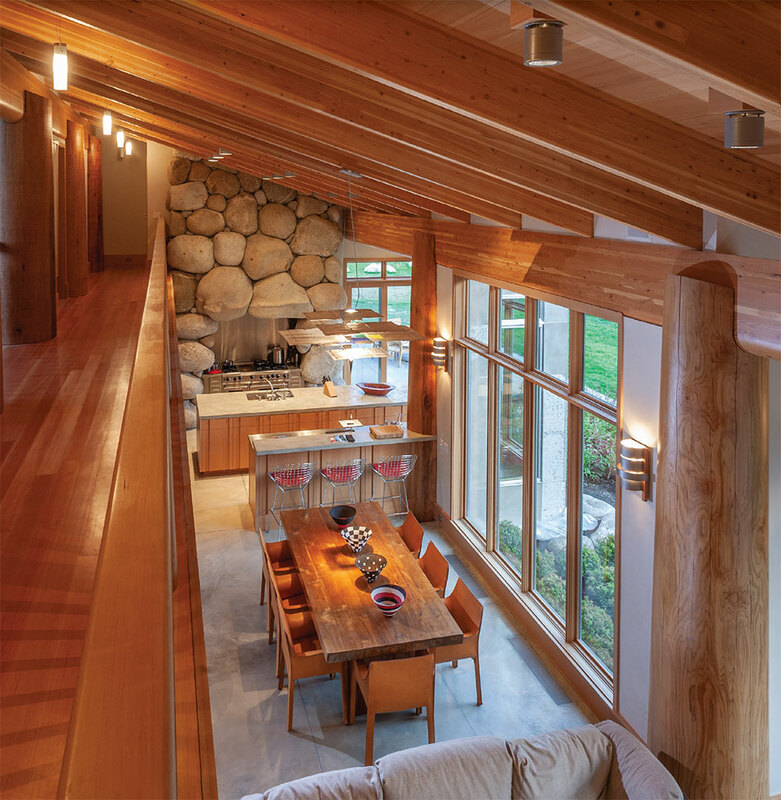 Jim Taft, with 42 years spent in the building industry, has developed a wide breadth of knowledge, and the desire to work directly with wood has always been at the center. Jim says, “I started as a carpenter, then moved into general contracting for years. But I always loved woodworking. 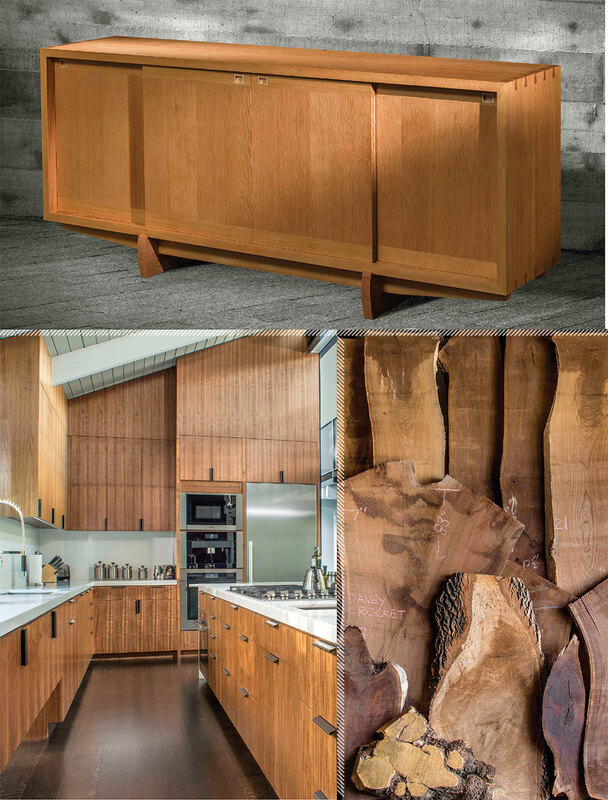 Building cabinetry was a natural progression, a way to incorporate woodworking and make sure I was putting the best products into the homes I built.” Taft realized over time that cabinetry fabrication was the area he wanted to focus on. That specialization now makes Taft Design Works a leader in custom cabinetry in the Sun Valley area, offering a wide range of products and styles, all guided by Jim’s wealth of expertise. 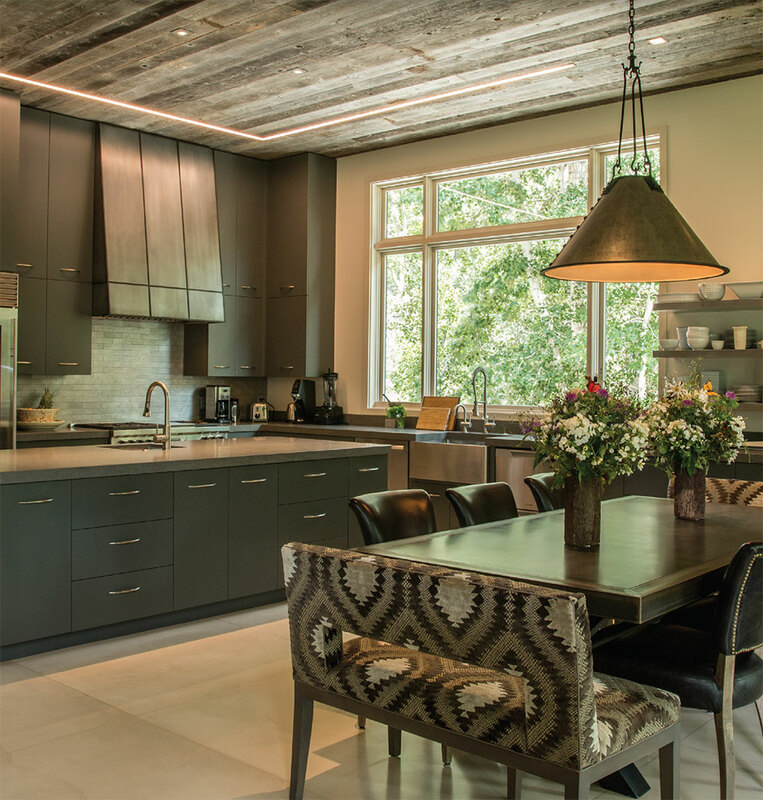 Kitchens are the center of a home and at the center of Taft Design Works’ portfolio. While Jim is hands-on in all parts of the business, managing both the shop and installation team, he says that his primary role is in understanding customers’ desires. Through consultation and careful measurement, Jim designs and drafts kitchen cabinetry to perfectly fit each client’s needs, beginning with a conversation about how the kitchen will be used. “We want to design cabinets that suit our clients’ lifestyles. That starts with understanding how they will use it. 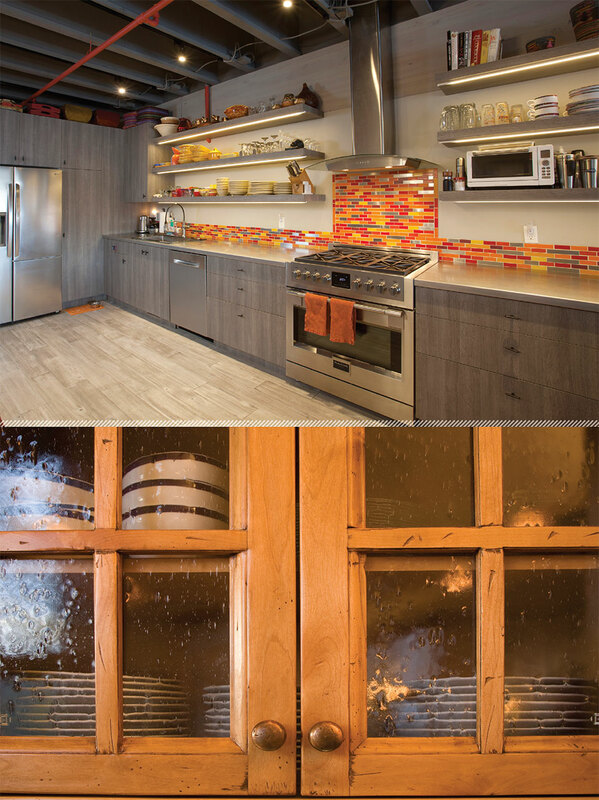 If they are accomplished home chefs, or only use their kitchen to make coffee, that information can help us give them the most functional space,” Jim explains. The range of materials and styles available through Taft Design Works is nearly endless. 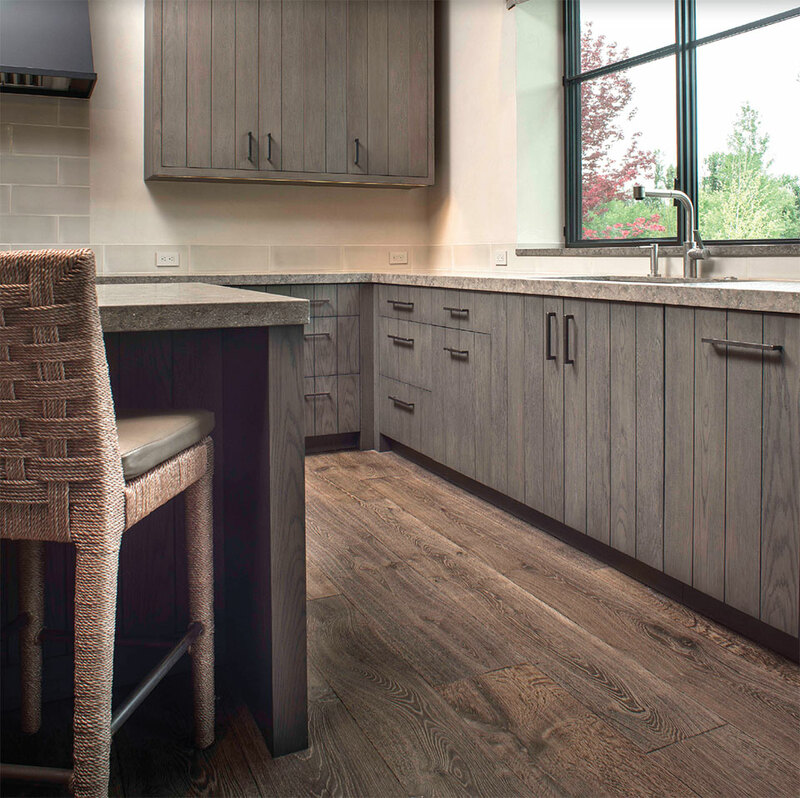 In addition to their custom work in veneer, reclaimed, and hardwood cabinetry, Taft has added two pre-finished cabinetry lines and quartz countertop products to their showroom in Bellevue. He says that pre-finished cabinetry options are adaptable to a variety of kitchen spaces, providing a cost-effective, quality solution for their customers. Over the years, Jim has seen a full arc of cabinetry trends and appreciates the wide variety of styles used throughout the Valley. He says, “We do hardwood Shaker-style cabinets with complex glaze finishes. On the other hand, we also see a lot of desire for the clean look of veneers, and the rustic look of reclaimed cabinetry continues to be a popular style for mountain homes.” The Taft Design team works to make sure the desired cabinet look matches the expectations of their clients. Jim’s experience shines here, and he knows first-hand how different styles of cabinets hold up to different types of use, and what material best fits the function. 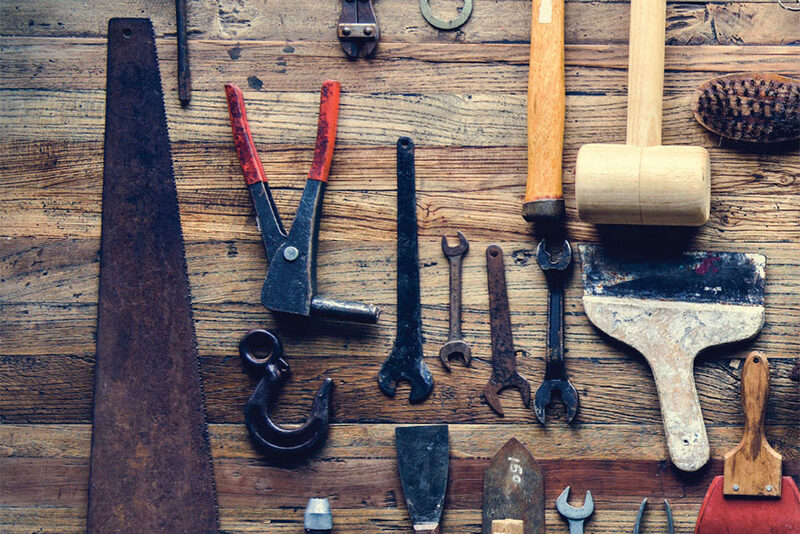 With all the time Jim spends designing layouts and managing Taft Design Works, he finds himself still craving the tactile challenge of woodworking that first brought him into the business. He feeds that desire with custom boat building. Over the years he has built a handful of drift boats, bending and finishing the wood in the evenings and on weekends. He says it challenges him—boat building is considered among the most complicated specialities of woodworking. “It’s good to stay hands-on in the trade, and I like for my team to see that I know what expert craftsmanship is,” Jim says. 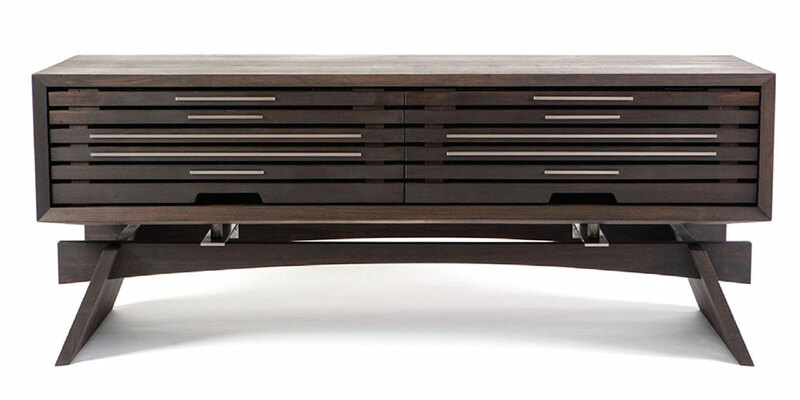 That keen eye for quality translates directly into all of Taft Design Works’ products. He explains this as he stands next to a dining room console with Molesworth detailing and birch bark inlays that he’s just finished. This classic western style is one that Randy has worked with regularly over the years. The console’s legs are new to his repertoire though. Stained a deep burgundy, they are the truly striking, sculpted feature of the piece. “These are from a 75-year-old Chardonnay vine from the Napa area,” Randy says, running a hand over the sinewy, curved ridges of the old vine, sanded and stained to an elegant finish. His latest table pieces include collaborations with local artists Janet Starr and Deb Rosen, who helped him design a dining table in sycamore slab—two large pieces, bookended and glued on the curve, with steel details and a maple base. “Sycamore is a beautiful wood, but not often worked with because it’s difficult to manage the lacy grain. It couldn’t be planed because of the grain pattern, so I sanded it by hand,” he says. On the other end of the design spectrum is a bird’s-eye maple slab table with a high-gloss finish, the result of an enormous sugar maple’s shallow root system. At Randy’s home and workshop (he built both) on the banks of the Big Wood River are stacks, bundles, great heaps of his raw wood collections—everywhere. “I might have a bit of a wood hoarding problem,” he jokes. “But let’s just call it curated.” He has foraged the timber on long walks in the surrounding forests, and through friendships across the West. He gives a show and tell of grapevine, massive maple stumps, and Idaho fir. One large bristlecone pine leaning against his shop wall, limbs still stretching from the deformed trunk, is particularly interesting. It was harvested from the Twin Peaks area at about 11,000 feet, an altitude where life is precarious and growth is slow. Randy estimates that the tree was about 1,000 years old when it finally died off. It was struck by lightning some hundreds of years ago, killing all but a small portion of the tree. The sapling that remained then grew from the base of the tree, twisting around the gray death of the central trunk, snaking up and around its mother in search of more light. The tree is still searching. Randy has held onto it for 20 years, waiting for the right project. “It’s so unique, and I know not everyone will be able to see it and have a vision for what it can be.” Randy does, though. He envisions stairs built around it, mimicking the curve of the tree’s long life. He sees, in three dimensions, how it will come together, and what it can be.